Almost a month away and already almost full. 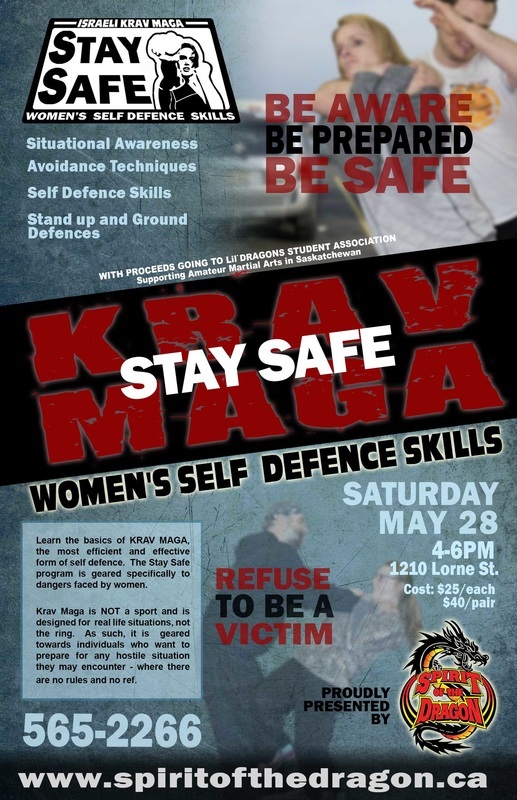 We are so excited for another Stay Safe Women’s Self Defense seminar. Join us to help increase your situational awareness, de-escalation skills and self defence skills. Everything from hair pulls to ground defences. Krav Maga is designed to help prepare you for any situation. This is not a traditional Martial Arts class, nor is it a Cardio-Kickin’ class – Krav Maga is hands on, street practical defence skills meant to provide you with the means to defend yourself. Components include hand pad and heavy bag striking training, hand to hand partner drills and scenarios, escapes and avoidance techniques as well as ground defences and escapes. The highlight, and most valuable portion of the program is the controlled simulated ‘attacks’ from our fully padded instructors – allowing participants to apply their skills in the most realistic way possible. Developed with basic fundamental body motions, Krav Maga is easy to learn and apply regardless of body size. This program focuses on the main threats that women and young girls may face and provides you with the skills necessary to protect yourself and your loved ones. ​We are proud to note that all proceeds from the Stay Safe program help support the Lil Dragons Student Association as they help promote a fitter and safer community.